The Yowza Pompano combines the lower body workout of an elliptical trainer with the abdominal and core workout provided by their patented Counter Rotation Core Motion. On many elliptical trainers, handlebars that move in a linear motion, add upper body exercise as well as generally increase the aerobic level. On the Yowza Pompano, as on the Captiva and Sanibel models, by replacing the linear motion with hand grips that require the torso to rotate, various abdominal muscles are used while still increasing the general cardio level. Quite clever actually, sit ups while standing, sort of. 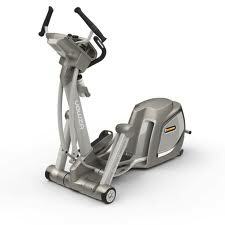 The stride length is a lengthy 20 inches and the elliptical motion on the Yowza Captiva is very smooth. Foot pads are large and adjust to the user foot position for comfort.Maximum user weight is a svelte 400 lbs. The Yowza Pompano also includes an Ipod docking station with speakers and a 3 speed cooling fan. Heart rate is monitored with contact grips. The display is large, backlit and very blue. There are lots of programs and the Yowza Pompano can store up to 9 different user profiles, great for multi user trainer needs. The warranty is excellent, lifetime on the frame and braking system, 5 years on parts and electronics and 2 years on labor.